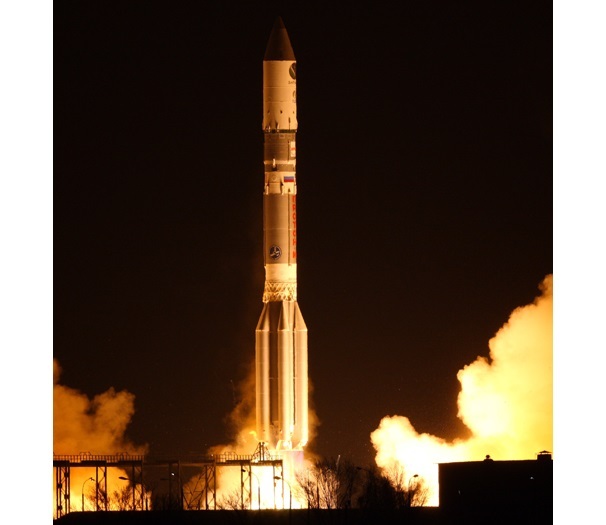 The ASTRA 2E satellite blasts into space on board an ILS Proton Breeze M booster last night at 3:38am Baikonur time (23:38 CET and 17:38 EDT on September 29). After a 9-hour, 12-minute mission, the Breeze M upper stage of the Proton rocket successfully released the ASTRA 2E satellite directly into geostationary transfer orbit, from where ASTRA 2E will be deployed at the 28.2/28.5 degrees orbital arc. The satellite was built for SES by Astrium of France. Based on the highly reliable Eurostar E3000 platform, the spacecraft carries 60 Ku-band transponders, including 12 incremental transponders for delivery of services outside Europe, as well as 4 Ka-band transponders. It will enable the delivery of next generation broadcast and broadband services in Europe, the Middle East and Africa. ASTRA 2E, which had a launch mass of 6 tonnes, will feature a wingspan of 40m once its solar arrays are deployed in orbit, generating 13 kW of spacecraft power at the end of its 15-year design lifetime. Trevor Harris: The satellite has a UK (OK, British Isles) footprint transmitting dish. As far as we know, any transponder's output can be routed to any transmitting dish, it's up to the leaseholder for the transponder to decide whether they want a European footprint, a West African footprint or a UK footprint. You're right that "Freesat" doesn't lease any transponders itself. They would probably benefit from being a broker to allow channels to launch without having to lease a whole transponder from SES - as Sky do. But Freesat is a marketing joint venture between the BBC and ITV plc, and doesn't have much capital of its own.
. I think it's likely that Arqiva will use this to supplement their large investment in Freeview - offering FTA satellite coverage to the channels they already carry on Freeview - and as a hedge against the government deciding to switch off large chunks of Freeview spectrum. Does this mean more channels on freesat... i was told by Sky sales person freesat from sky get more channels than freesat... is this true? Personally, I'm not sure the extra channels on the Sky package are anything to get excited about ('Holiday & Cruise'? ), and your paying £25 if you've still using Sky equipment, and £175 as a one off if you dont (and £50 if you move). I cant see if you can record, but if they charge you a tenner a month for that as well, your talking £150 pa. You can buy a cheap Freesat PVR for that. Luxembourg, Paris, 4 October 2013 - Following the decision of the Arbitral Tribunal constituted under the rules of the International Chamber of Commerce of Paris that concluded the first phase of arbitration in September 2013 and a preliminary injunction by the regional civil court of Bonn, SES (NYSE Euronext Paris and Luxembourg Stock Exchange: SESG) and Eutelsat Communications (NYSE Euronext Paris: ETL) have collaborated in the best interest of customers to ensure a smooth transition of operations on frequencies at 28.5°E under a German filing. Mike B the sales man say on Sky box as freesat from sky.. has 240 channels free.. while freesat has 150 channels... i am not getting subcripton at all... freesat recorder boxes are over £150... i want brand new... wont have 2nd hand coz i had problems with 2nd user boxes.... plus £120 to install new dish and cables.... that makes freesat set up very expensive around £340 pounds to pay up front. 2) your getting no subscription - you kind of are. As far as I'm aware (and I did try to check it out) freesat for sky gives you more channels, but you cannot record them on your existing sky box without paying for that function(if someone does know, please tell). Since that's over £10 a month, your paying £120 a year to record - which makes £150 for a freesat recorder look attractive, as I originally pointed out. 3) if you have a sky dish, why do you need to buy a new one? They will leave the dish, and if it has two lnbs, it's a straight swap. This is covered in the modt frequently asked questions - it's the most popular question! Look at the long term costs, and find out the facts. rob: No matter how old or rusty your dish might be provided that it hasnt been moved then all you require is the LNB replaced with a quad version (twin types no longer manufactured) and a second cable run from the new LNB to a Freesat PVR, the undermentioned link being to a grade "A" model manufactured by one of the most reliable brands around. By the way, a complete quad kit only costs around £10.00 or so from a number of e-bay outlets, although obviously someone would have to install same for you.